I purchased one of these bottles, and couldn't figure out how to use the sipper lid specified in the instructions. Could you give me some help? I'm not sure what you mean about the sipper lid. Mine only came with what you see in these photos, and nothing else - not even instructions. It does have something in the middle of the screw-on cap, perhaps a pressure relief valve...? I've never actually figured that one out. Does everything it claims to, very sturdy, easy to hold, clean, great taste, perfect size for cup holders and best of all keeps drinks cold for hours! I would like to see a smaller version made for kids. I'm out the door to buy one for each member of our family. Great product! Dear Anonymous - there is no sipper - it's a twist off lid. Drink directly from spout. The blue dot is part of design and not meant to be functional. Mine came with instructions and the lid is meant to be a sipper. Thus being said, the instructions on how to work the blue dot involved turning the upper part of the lid a quarter turn and pressing the blue dot in order to obtain liquid. This did not work and we simply remove the lid. Can you use hot liquid too? The double-walled body doesn't heat up the way that metal water bottles do, and the only plastic that the liquid would touch is dishwasher-safe, so temperature presumably wouldn't be a problem... but the thermos website only mentions that it's "Ideal for water, iced tea, juices and sports drinks." So my answer would be that I don't understand why it wouldn't work with hot liquids, but just the same, I wouldn't recommend it and it's a 'try at your own risk' thing. The Thermos website has all kinds of odd acrobatics going on in its link structure, so any link I post will probably be broken within weeks. Instead, you can find it by doing a google search on its UPS code: 0-41205-61886-7. 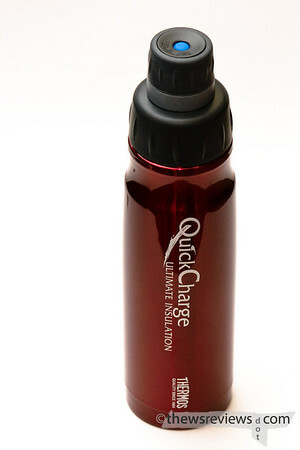 We really like our Quick Charges ... for hot or cold. Hot stays hot for at least 6 hours (haven't experimented for any longer than that) and we have had ice cubes in water still rattling around after being left for two and a half days. The "soft rubber" feel on the mouth is great (especially when drinking while moving) and the easy on - easy off top screw lid for sipping. Like so many others, gave up on the little blue dot. I just got one of these things and I too was humbled by the blue dot.. Mine came with the confusing instructions as well. Visiting Thermos' website revealed that these are the generic instructions for all models of beverage holders and I don't think any of the three different operating instructions that came with this bottle actually apply to it -- i think the instructions are included for the care and warranty instructions. (The instructions explain how to use 3 different types of Thermos bottles). I popped out the blue dot and thought about it. My guess is that it might be a "contents under pressure" indicator. If your forgotten beverage ever expands in the container I think the thing will stick out more noticeably than usual, and so you can be more careful opening it up. Haven't tested this though. "contents Under Pressure"? Wait a minute everyone! Here`s my guess. "The blue dot" is nothing more than a seal for a 1/2 inch hydration tube. You pop it out by unscrewing the cap and pushing down on the "blue dot" with a pen (stick, whatever)Insert tube and voylà, hands-free hydration. I got the thermous(red) with a sling pack(red also) from MEC. 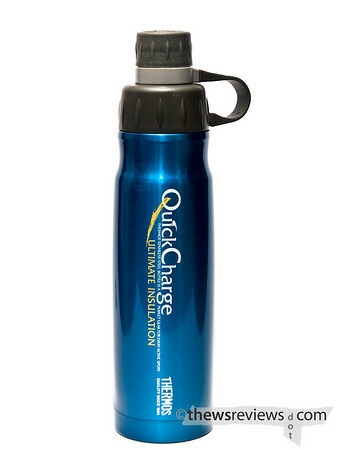 I love my Quick Charge Thermos, it keeps the drink inside cold for a lot longer than any other water bottle I have ever had. I would like to see a larger version of this thermos. I quit trying to figure out the blue dot (I got it as a gift without instructions). I just drink from the bottle. Works for me. I really like this bottle. I have been using them for several years for hot water. I take it just about everywhere.